What's Anorexia? Anorexia is loss of appetite i.e. lack of interest in eating. This can cause weight loss and weakness. Remedies These natural remedies are sure to help perk up your appetite. 2. Apple : The old saying "An apple a day, keeps the doctor away" stays true for anorexia individuals as apples aid in digestion and also boost your appetite. 3. Ajwain(carom seeds) : Swallowing 1 tsp of ajwain with or without water, 3 to 4 times a day is another remedy to enhance your appetite. 4. 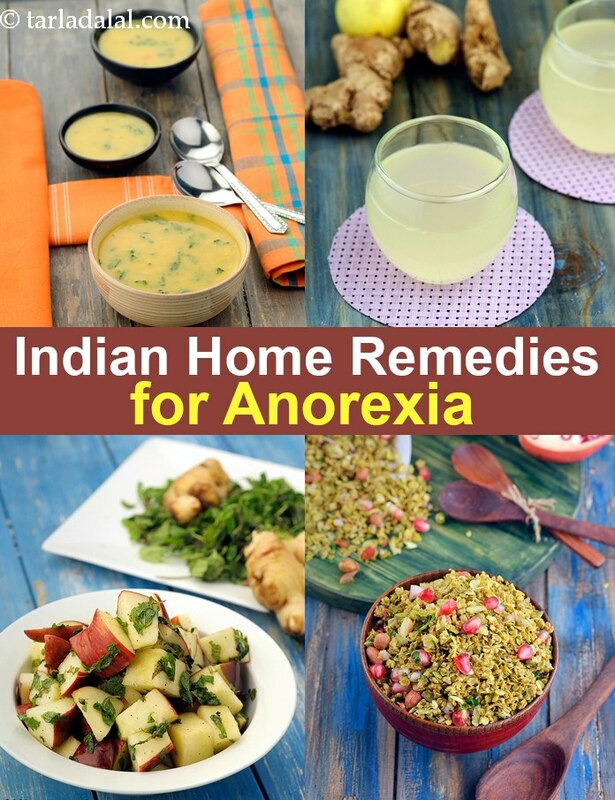 Asafoetida (hing): Two pinches of asafoetida mixed in 2 tsp of ghee when taken before meals also helps to overcome anorexia. 5. Pineapple : Having a few pieces of pineapple sprinkled with salt and black pepper helps to restore lost appetite, especially for kids. 6. Lemon : Equal quantities of lemon and ginger juice should be consumed every day before meals to decrease anorexia. 4. Ready-to-eat foods like wafers, popcorn etc. 1. Eat in a relaxed and calm environment and make it a pleasurable experience and not a "task" that has to be completed. 2. Have frequent and small snacks that are healthy and are high in protein and calories. Try a filling shake or a bowl of soup like Carrot and Spinach Soup, if you don't feel like eating much. 3. Have variety in terms of colour and texture of food to be served. Present foods in a child-like fun way. Make sandwiches into interesting shapes or decorate fruits, breads and vegetables with interesting toppings. 4. Avoid drinking liquids at meal times as they can give a feeling of fullness causing you to eat less. 5. Have a walk before meals if possible. Fresh air often helps to perk up the appetite, as does a little activity.